Providing a platform for users to book that bus ride to their destination is what we breathe for. 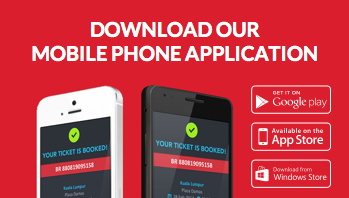 We enjoy making the simple task of booking a bus ticket easily accessible and mobile. But for us, it’s more than serving – it’s how to best serve. Our visuals of speech are how we reach out! An impactful identity is something that anyone can have, though making one is a challenge. One thing for certain is that we want to give not just a good impression, but the right impression, to potential users. With a straightforward icon and the suitable colour palette that defines the tone of our content and service, users remain assured of what we have to offer. Over the years as our company has grown, so have our designs. From starting with basic information sharing on routes and buses, we’ve learned to enhance the way we communicate. Copy styles vary with the audience, not to mention the creative transformation in how the visuals are designed and redesigned. And of course, remaining relevant has kept our user base fresh. Apart from marketing what we do, we love being a channel of other interesting topics that transport goes beyond – travel and leisure. And in between it all, to celebrate according to the moment! Inspired yet? We’ve summed up as much as we could on our creative efforts through an infographic!